It does not only falling out but also has problems with growing long, is weak and brittle – this type of hair is a real nightmare that gives women and man many sleepless nights. Luckily enough, Nitai brand has faced this problem of many people’s and presents the way of eliminating it. Khadi Pure Ayurvedic Vitalising Hair Oil is a 100% vegan product that is closed in a simple yet elegant bottle. The container’s label is decorated with subtle oriental motives. The product features a glass dropper, which makes the application easier. The aesthetics is even more impressive thanks to a golden cap, which shields the dropper. Khadi Pure Ayurvedic Vitalising Hair Oil contains a well-selected blend of oils. amla oil – prevents hair loss and premature greying. Strengthens and gifts strands with gloss. bringraj oil – accelerates hair growth, penetrates deep into hair bulbs to regenerate them. brahmi oil – prevents hair loss and strengthens hair follicles. sesame seed oil – delivers gloss to hair, nourishes it and moisturizes. At the same time, the oil counteracts strands getting brittle. coconut oil – protects hair structure, which is why, strands are no longer prone to impurities. castor oil – eliminates dandruff and psoriasis, accelerates hair growth and gifts strands with gloss. rosemary oil – works antifungal and antibacterial. Counteracts any possible scalp infections. carrot seed oil – nourishes hair, stimulates production of collagen fibres and normalizes work of sebaceous glands. 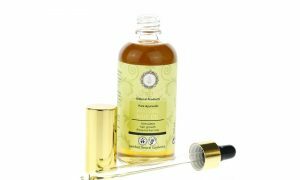 Khadi Pure Ayurvedic Vitalising Hair Oil strengthens damaged hair, prevents brittleness, eliminates dandruff, stops hair loss, stimulates hair growth and counteracts dehydration. Moreover, the oil has very intensive herbal aroma. The bottle stores 100 ml of the oil. 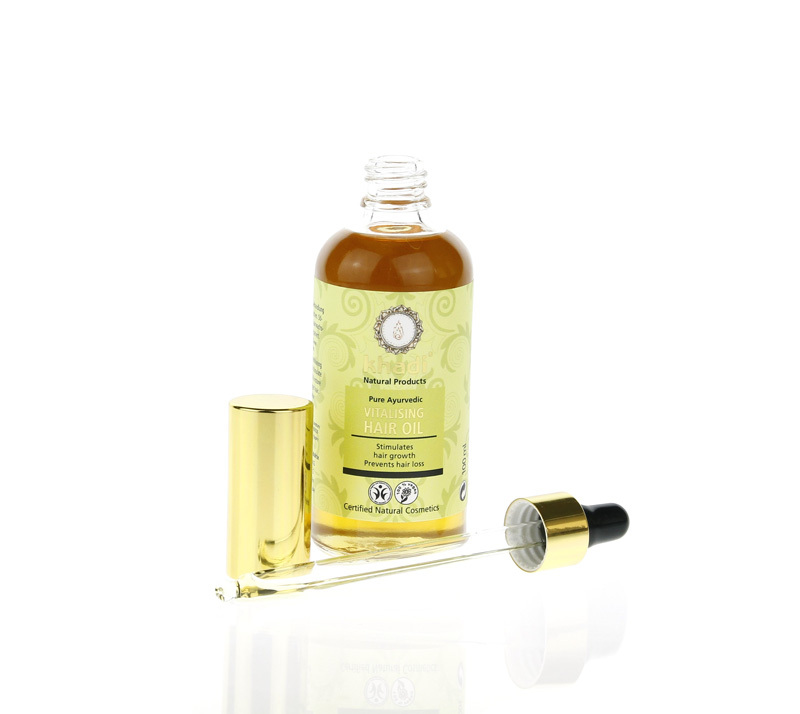 Khadi Pure Ayurvedic Vitalising Hair Oil is efficient and holds out long. 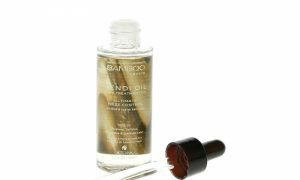 The oil has to be applied to hair and scalp (one spoon of oil or one full dropper is enough). After two hours the oil has to be removed. If scalp and hair require more intensive regeneration, the oils can be left on hair overnight.